The new year is well underway, and time is doing what time does best: moving quickly! 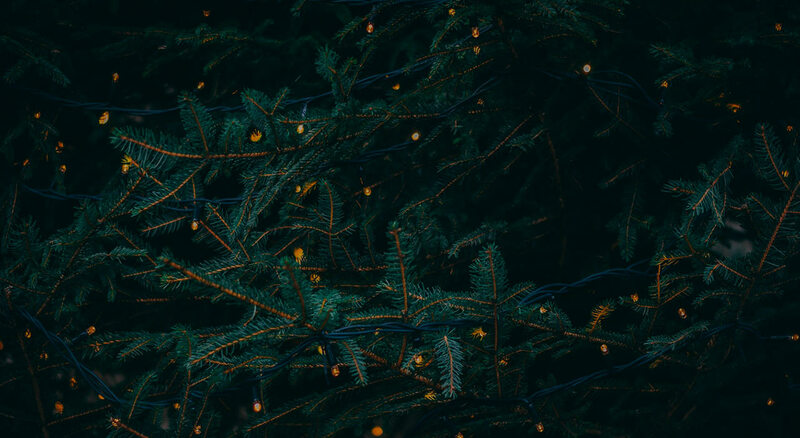 With the chaos of the holiday season behind us, we wondered: what types of emails do brands send during these *relatively* quiet winter months? What are the post-holiday, starting-the-new year email campaign trends so far? We took a closer look and discovered three patterns. 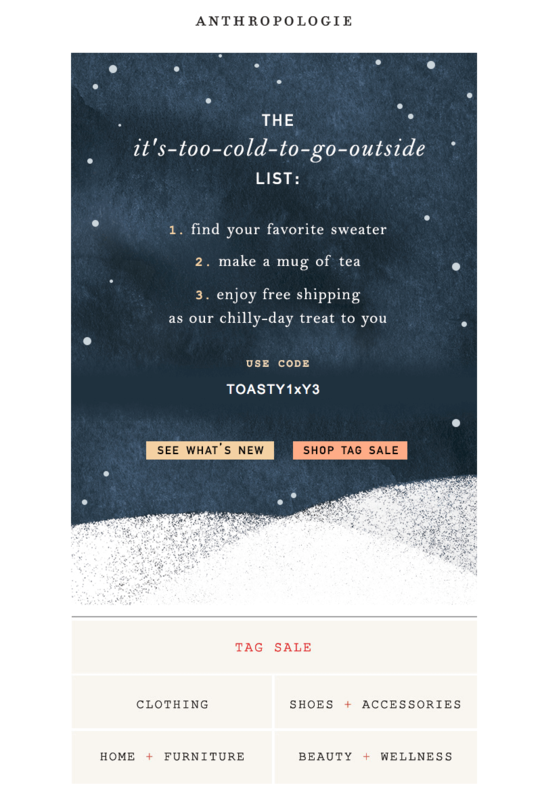 Here’s a round-up of a few favorite winter email campaigns with design tips for making them your own! For most of the U.S., winter = cold weather. That means readers are currently into those cozy, by-the-fire, hygge vibes—even in their inbox. 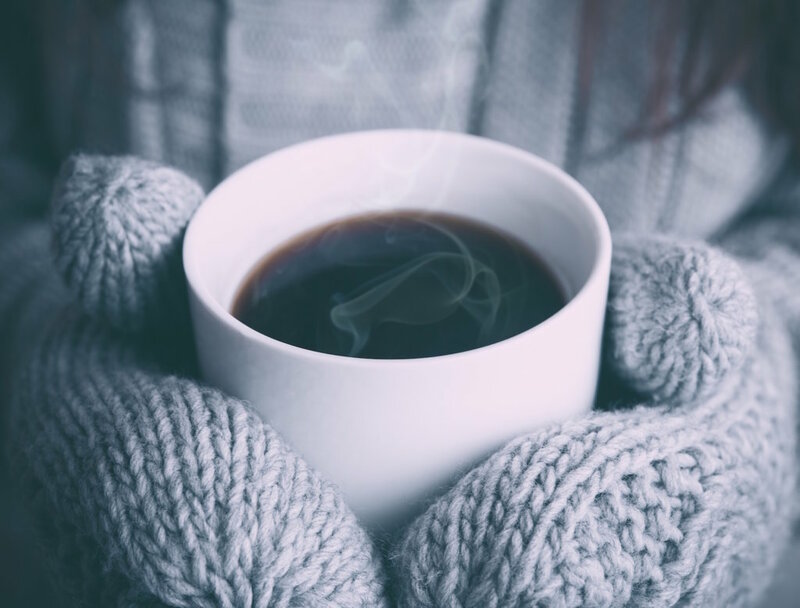 Here are a few brands capitalizing on the winter weather in different ways. Format your bulletproof button(s)—also atop the image (though the image itself can be linked to your landing page, too). The Tie Bar created a “Cold Weather Survival Kit” to showcase some of its winteriest products. Leveraging a reader’s local weather (or another calendar event) is a great way to “hand pick” products to show readers. This email also uses funky content blocks (with ample padding between each one) in its countdown. This email from Brooklyn Craft Company was sent during the bomb cyclone winter storm that hit much of the northeast in early January. Geo-targeting readers—just make sure you collect that data!—is how brands are able to send more relevant, personalized content to segments of their reader base. New Year’s Day is weeks behind us, but let’s be real: many of us are still getting our act together when it comes to planning for 2018. And while not everyone likes to set goals, for most people, the new year does bring about a fresh start feeling. At least, that’s what the emails seem to indicate. We spotted a lot of refresh and renew-themed emails aiming to appeal to readers’ desire for a clean slate. Here are a few of those. What do January and face wash have in common? 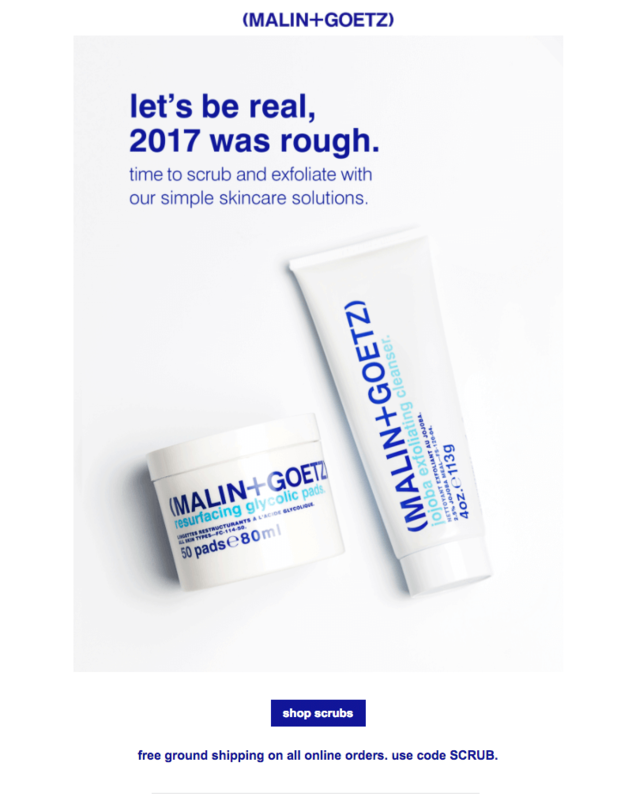 Not much on first thought, but in this clever campaign from Malin+Goetz, the brand ties the two together with spare, effective copy. And a free shipping promotion. Subject: Want $20 off our jeans? This Madewell email was one of several we spotted allude to spring cleaning, with more of a new-year, new-cleaner-you type message. Madewell’s recycle-your-jeans program isn’t new, but our guess is that they’ve chosen January as a good time to remind readers about it. In the BEE editor, recreating the email’s responsive, infographic-like body grid is easily done. Simply format your text and choose simple black borders. Custom text headers can be added as images. Et voilà! Subject: All the kitchen tools you need to tidy up your year. Food52 is another example of a cleaning-themed email. In 2018, we’ll all be tidier, right? In this responsive grid layout, each content block is complete with an elegant photo and short text description, and gray and blue tones add a wintry effect. A few brave brands have been bold enough to mention the upcoming season—spring—in their email campaigns. But these spring-oriented messages are careful not to overdo it. Visually, they’re not full of pink blossoms; instead, the emails have a subtle wintry feel. That hero image is animated! 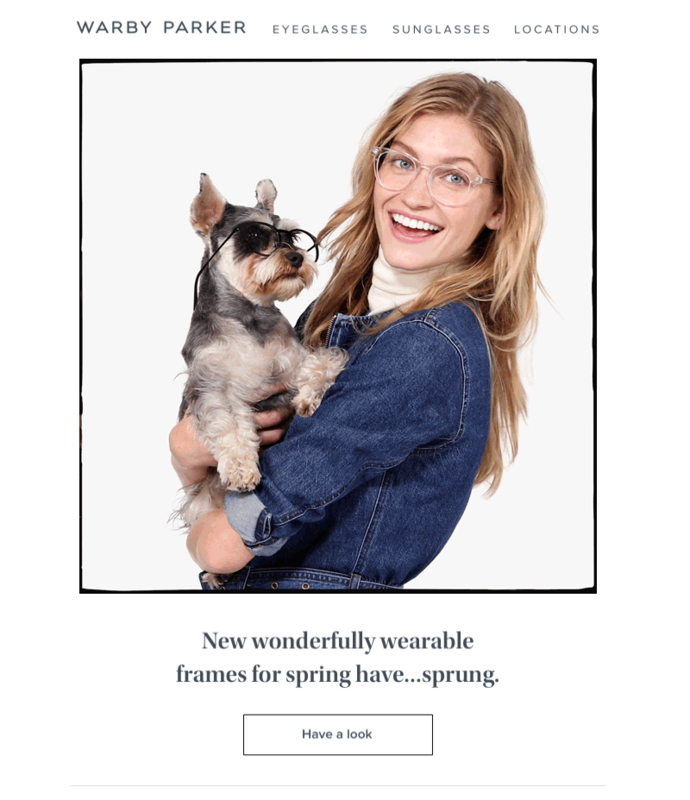 Even though Warby Parker has announced that these frames are for spring, the model pictured is wearing winter clothes, and the subject line focuses simply on new frames (not spring frames). 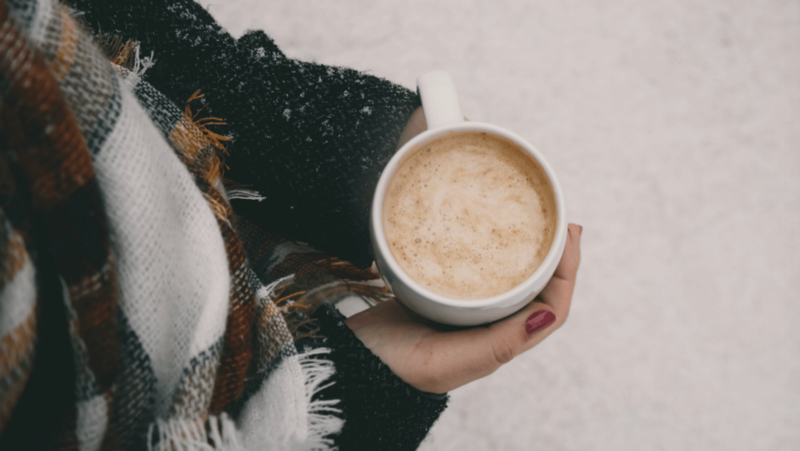 Going too heavy-handed on spring themes can alienate readers who are just trying to stay warm in 5-degree weather and aren’t ready to plan for April quite yet. Plus, if your product really is for spring, why should readers click or buy now? One way to get a taste of spring now is to go on vacation. For many brands, appealing to the traveling crowd is a wise move in January and February when some customers head south to thaw out. When it comes to design, we love that this email from Citizens of Humanity features a whole module of user-generated content. Subject: New garden tools for the seasons ahead. 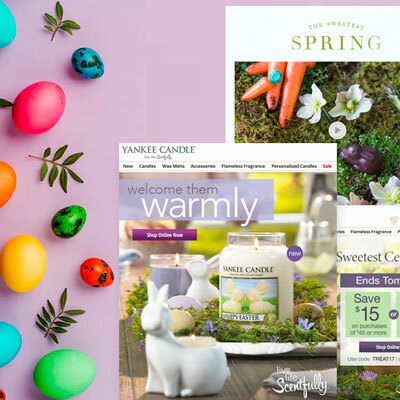 There are light spring themes in this email, but for gardeners, it may not be too early to start planning. Many may “plant ahead,” as Terrain‘s hero image describes. This modular email is pretty to look at—even though our gardens outside aren’t green yet. Sign-up for a BEE Pro free trial and you’ll be up and running quickly. The drag-and-drop editor is easy to use, comes with built-in templates and stock image libraries, and it’s now able to connect directly to MailChimp. Designing is a cinch! Start the new year by using BEE Pro and let us know how it goes!